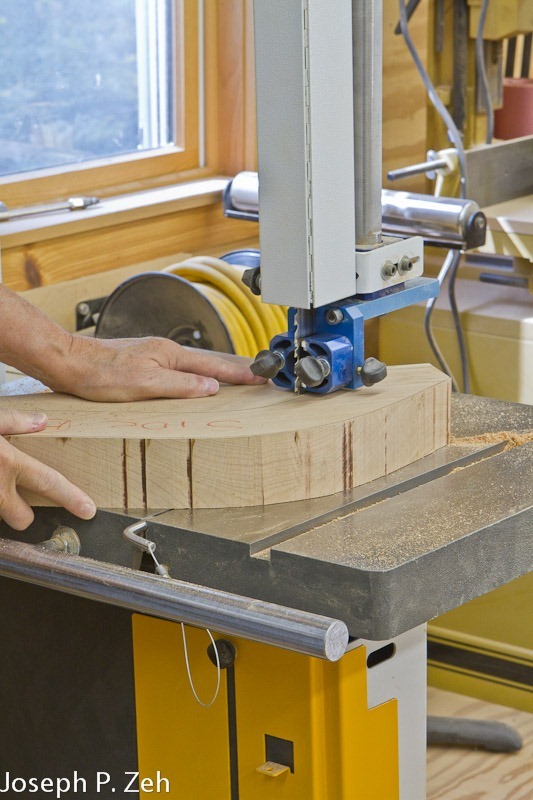 If you wish to build this stand you can go to my Free Plans page (menu), look in the spreadsheet under Tables for Shaker Round Stand. 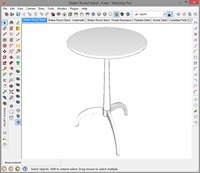 Click the smiley face in the SketchUp column to download the SketchUp model and shop drawings. 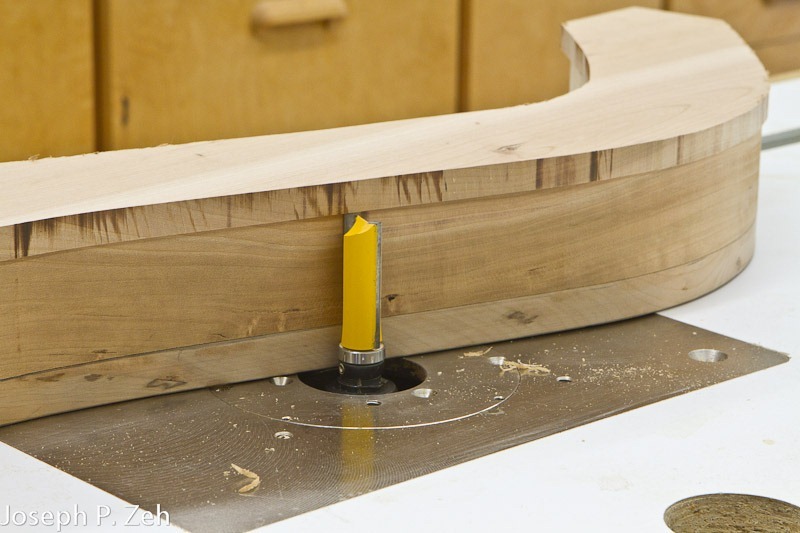 You can print out a full scale drawing of the pedestal and leg used in this piece to create templates for the shop. 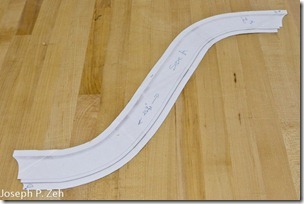 If you have trouble printing to scale in SketchUp see my post Printing To Scale With SketchUp Make & SketchUp Pro 2013. 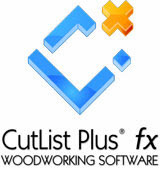 The techniques used in this post also works for SketchUp version 7 & 8. 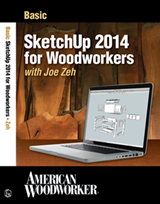 It seems printing to scale is one of the most difficult procedures for SketchUp users to use. This condition is not helped by the fact that SketchUp has a poor implementation of printing. 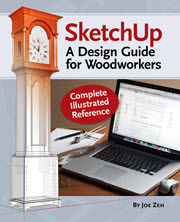 In fact, I believe the printing implementation in SketchUp is handicapped with software design bugs that have been there since the first release of SketchUp. Hopefully, with Trimble acquiring SketchUp, a more appropriate support budget will be planned and this issue will finally be resolved. In the meantime this article will provide you with some tricks that can be used to overcome these problems. I use printing to scale frequently to create shop templates. 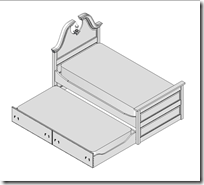 One such example is the swan neck that frames the top of a trundle bed headboard shown right. This template is much larger than one 8 ½” x 11” sheet of paper, but my printer only prints 8 ½” x 11 paper. What I did was print at a 1:1 scale in SketchUp which required about nine sheets of paper. Most of them were blank, so returned them to the printer tray. 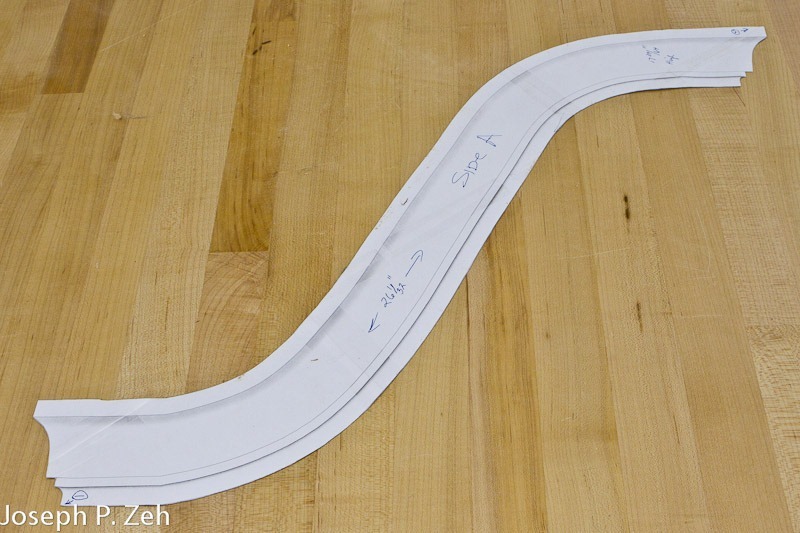 The three sheets that contained printed information I taped together connecting the line precisely. Then I backed the paper with self adhesive clear plastic, which can be purchased at any office supply store, and cut the template out with scissors. The clear plastic provided stiffening for the template and edges that will not collapse as you trace the template unto your stock. 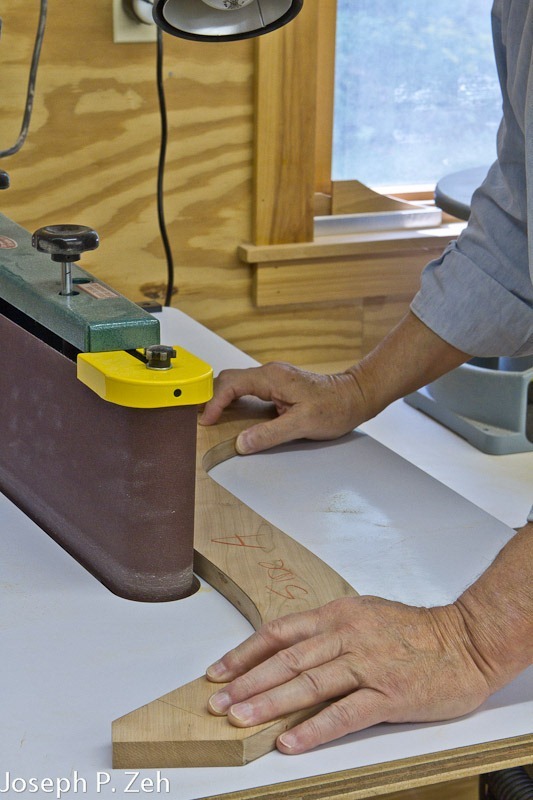 The picture below shows the swan neck milled using the template above right. 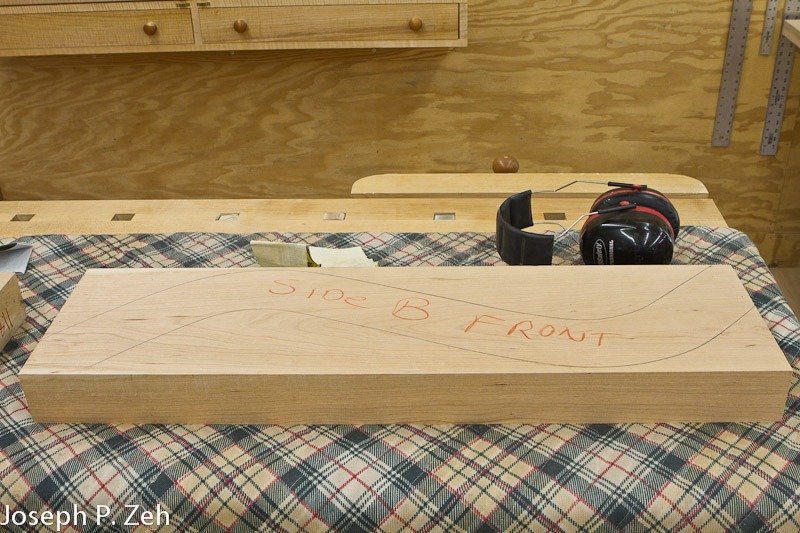 Also shown below is a template used to shape the headboard itself. Owing to symmetry I didn’t need both left and right swan neck templates, and a full headboard template; I only needed one side for the templates because they can be flipped to produce the mirror image. I also use SketchUp to create shop drawings. Because I print off fully dimensioned drawings for all milled pieces, there is usually no need to print my drawings to a predetermined scale, I just read the dimension off the drawing. However, there are times when a scaled drawing is necessary. 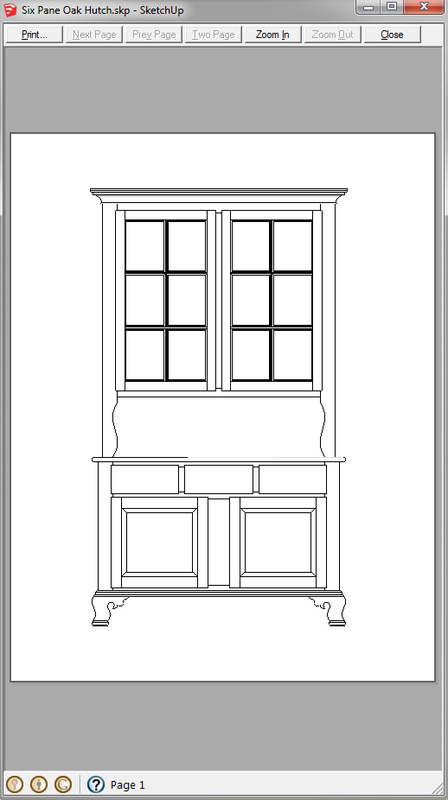 For example, when printing standard views of an architectural drawing a standard scale such as ¼” = 1’- 0” is needed. So let’s get into the how to of printing to scale. Printing to scale in SketchUp is not difficult; you can print at a scale of 1:1 or any other scale you desire by following these five steps. 3. 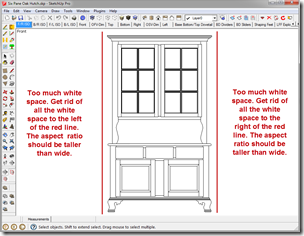 Adjust the window and model size to minimize the amount of white space around the model. This is to compensate for what I consider a software bug, and is the toughest and most critical part of the process. Steps One and Two are very important. 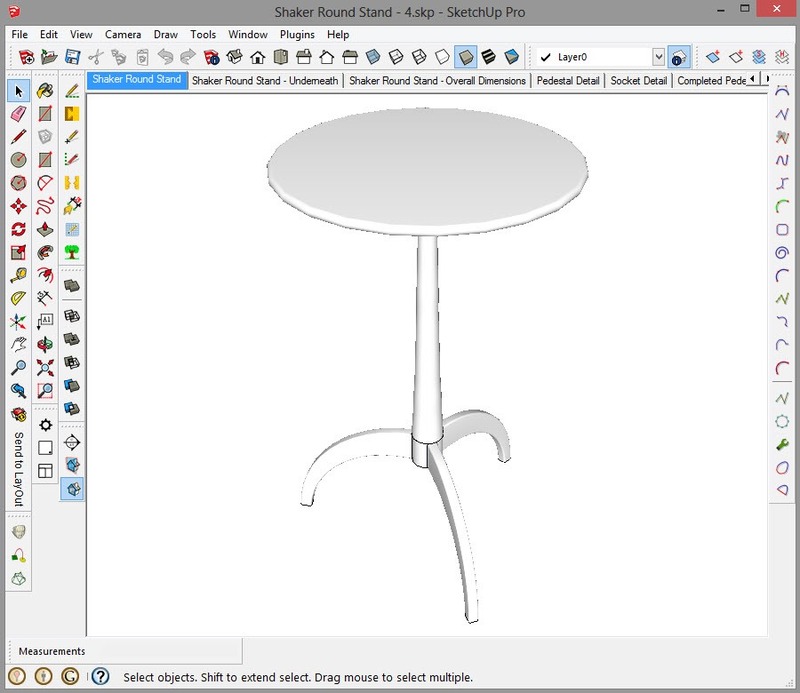 SketchUp does not permit printing to scale using either of the other two Perspective views because it is impossible for perspective views to yield a scaled drawing. Step three is required because there is a printing behavior that I consider a software bug when it comes to printing to scale. 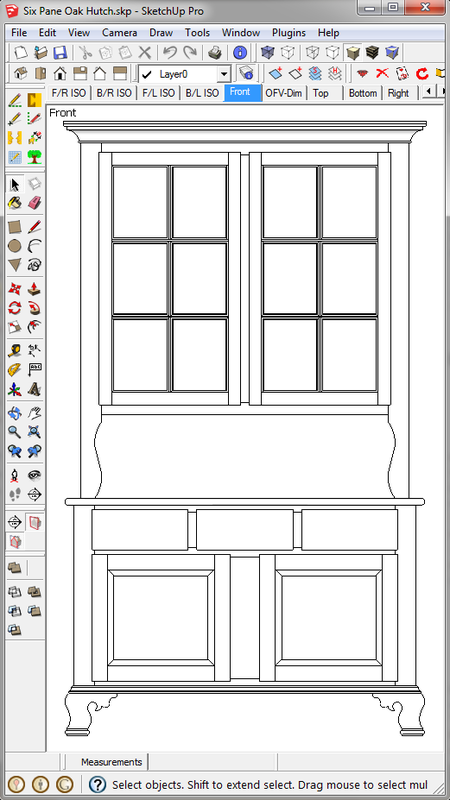 If you are going to print to any scale, including 1:1, first resize you drawing window so there is a minimum amount of unused drawing area on all sides of your drawing. Failing to do this will result in multiple pages being printed when you need only one, or far too many pages when more than one is needed. The trick here is to estimate and fix in your head, the aspect ratio of the model you want to print. Next shape the window area to the same aspect ratio. 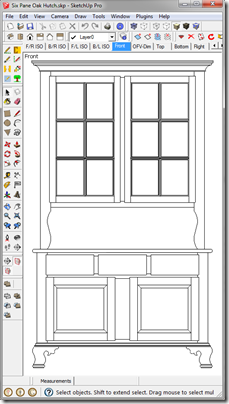 Then use a zoom tool to center and enlarge the model to use all the window area available. 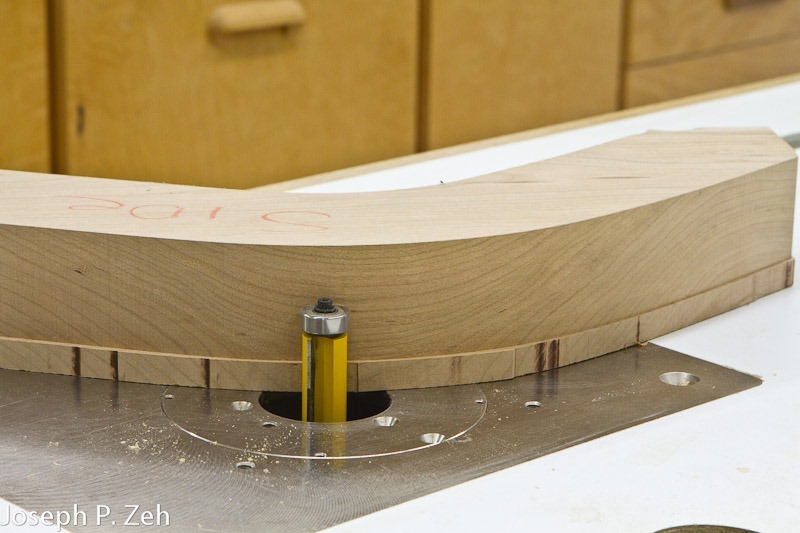 You may have to iterate these last three steps to get the optimum setting. Try to make your window as large as possible while leaving almost no unused white space on either side, top or bottom of the window. The image on the previous page shows a case where there is too much white space on the right and left, but about just enough on the top and bottom. This is because the aspect ratio of the model is approximately 1.7:1 while the window is approximately 1:1.5, nearly the reverse. The aspect ration of the window has been adjusted in the image at right to get a near optimum fit. Notice how little white exists around the periphery of the model. This model is correctly “cropped”. We have completed steps 1 – 3 above. Now we have to decide what we want to do next. If this printout is to be used as a template then we need to use a scale of 1:1 scale. 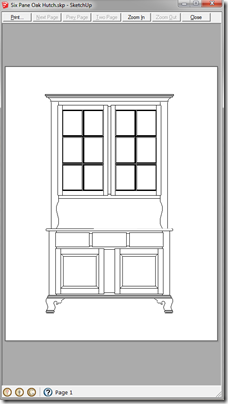 However, this model printout is not likely to be used as a template, but likely an elevation view of the hutch; which means it will be printed to scale on one page. The question is what scale? The scale can be determined analytically or empirically. Analytically we start with the size of page we are going to use and then subtract the unprintable margin dimension from each edge. For example, if we are printing on 8 ½” x 11” paper with an unprintable margin of ¼” per edge, then the printable area is 8” x 10 ½”. 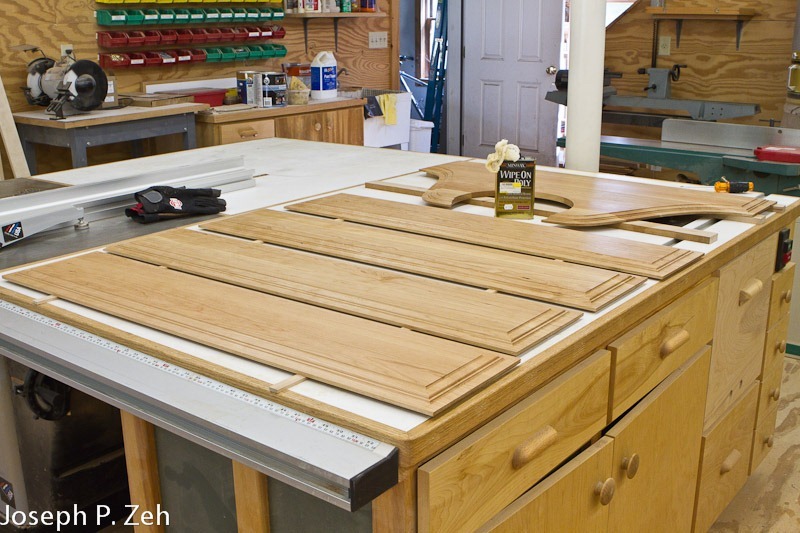 This hutch has overall dimensions of 52” wide by 88” tall. Printing the page in portrait view is the most efficient selection for this case. 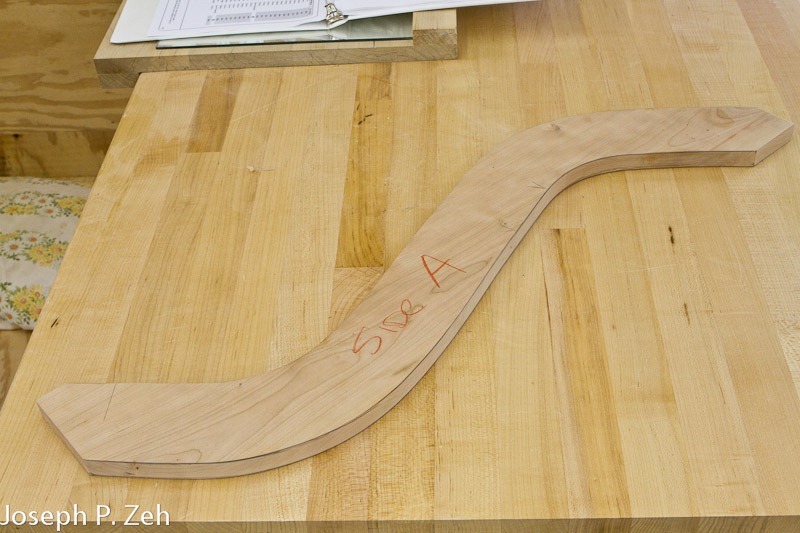 This means the 88” dimension must fit in the 10 ½” height of the page. 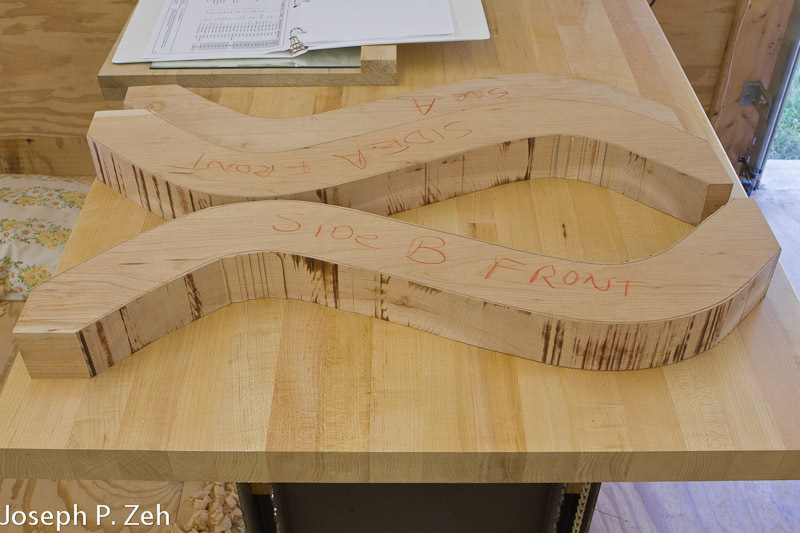 Similarly, 52” must fit in the 8” width. Use these two sets of numbers to calculate two scale factors; 8.3:1 and 6.5:1 respectively. We must use the same scale factor for both dimensions and so we need to use the larger one. However, 8.3:1 is a difficult scale to use so we can go with 9:1 or 10:1. Either will work in this case, but 10:1 is probably more useable in terms of making measurements on the printout and calculating the actual dimension. 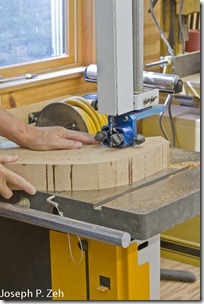 The image at left shows the setup for this case. In the Print Preview window above notice that “Fit to page” and “Use model extents” are both unchecked. There are four Scale inputs which the user need to fill in. In the “In the printout” input box I entered 1 and in its dropdown box chose Inches. In the “In SketchUp” input box I entered 10 (I will explain 10.000001 in a moment) and in its drop down box chose Inches. These inputs defines a scale of 1” = 10” or architecturally 1” = 0’-10”. Here is an important little trick; after entering the four inputs in the scale area, place your cursor in the Page size “Width” and then “Height” input boxes. Don’t attempt to input anything or change what is there, simply place your cursor in each input box. 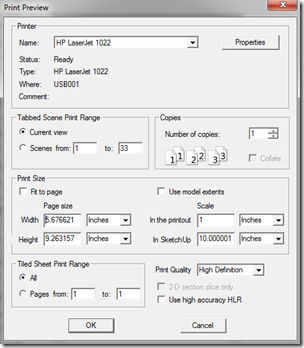 This will cause SketchUp to calculate the page dimensions required to print your model. When this happens the numbers in the Scale input boxes may change slightly; in this case 10 was changed to 10.000001. It might just as well have been changed to 9.999999. This has to do with the precision the software is using to make calculations. Don’t worry about this. The important part is that when you have completed this step look at the “Tiled Sheet Print Range”. 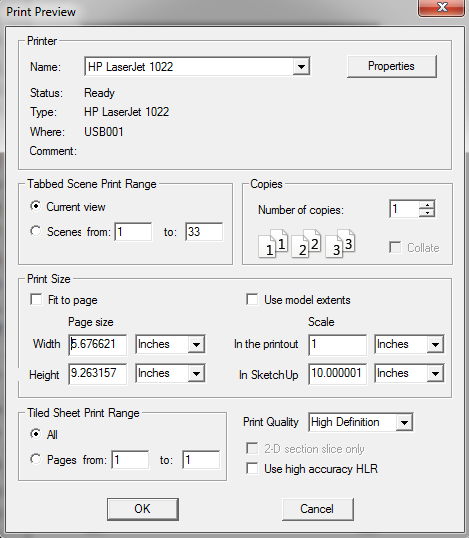 If the radio button chosen is All and the “Pages from” input boxes says 1 “to:” 1, then you are assured that you can print your model on one page with a scale of 1” = 10”. Hit OK and you should see a Print Preview shown at right. Choose Print to print the model to scale. 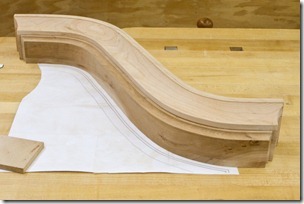 You can empirically determine the scale required to fit the model on one page. After completing step 3 above open the Print Preview dialog box (File/Print Preview). Place 1 in the Scale “In the printout” input and Inches in its dropdown box. These parameters are a guess based on my knowledge of the model. If I were printing an elevation view of a house I might start with ¼ in the input box. 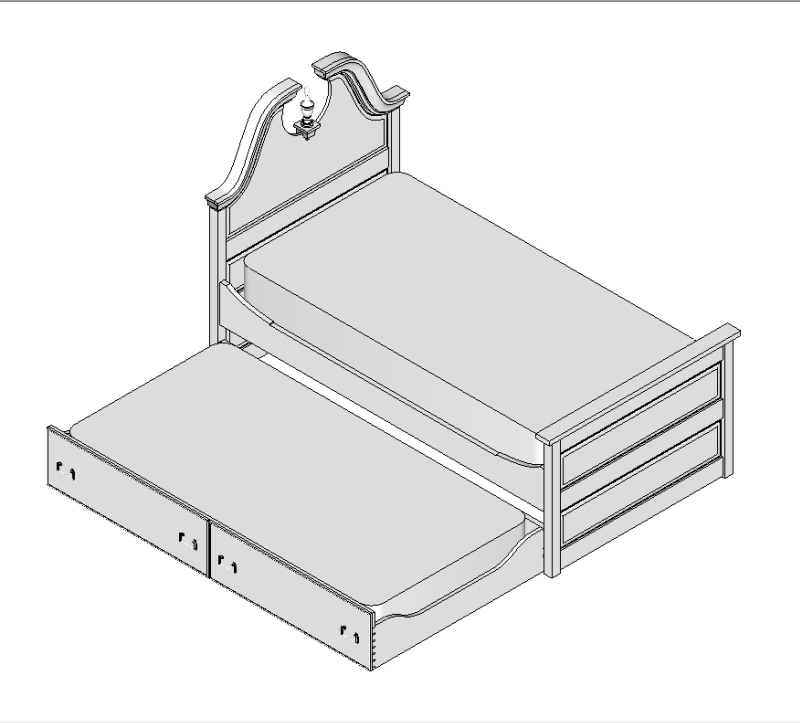 Next choose Inches for the “In SketchUp” dropdown box (if the model were a house I would probably choose Feet). Now enter pure guess in the “In SketchUp” input box. 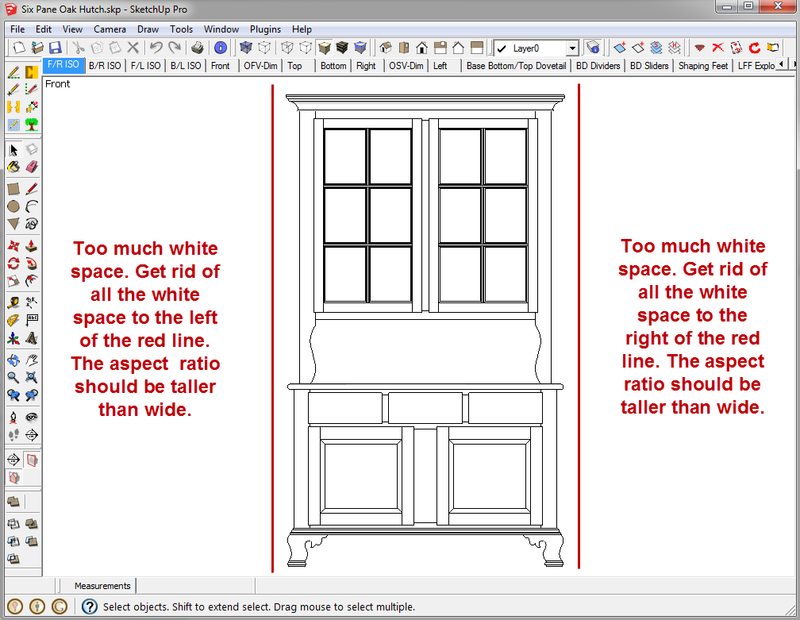 Place your cursor in both Page size input boxes to instruct SketchUp to calculate the page size. Then look at the results in the “Tiled Sheet Print Range” area. If it indicates more than one page increase your guess for the “In SketchUp” input and enter your cursor in both Page size input boxes again and check your results. If your first guess resulted in only one page try decreasing it until the number of pages is greater than one. Use this iterative process to choose a scale you are happy with. Printing to a scale of 1:1 is the same for steps 1 – 3. After that you enter 1 and the same units for both Scale inputs. Then you print all the pages required. Put the blank sheets back in the printer tray and assemble the remaining pages as discussed earlier. Good luck and I hope this tutorial helps.